To be a successful farmer you have to be a jack of all trades. Some days you are an electrician, other days you may be a plumber, and sometimes –on a good day- you get to farm too! The Robertson family from Hopkinton, NH spent the last year adding yet another job title to that list: Television stars. 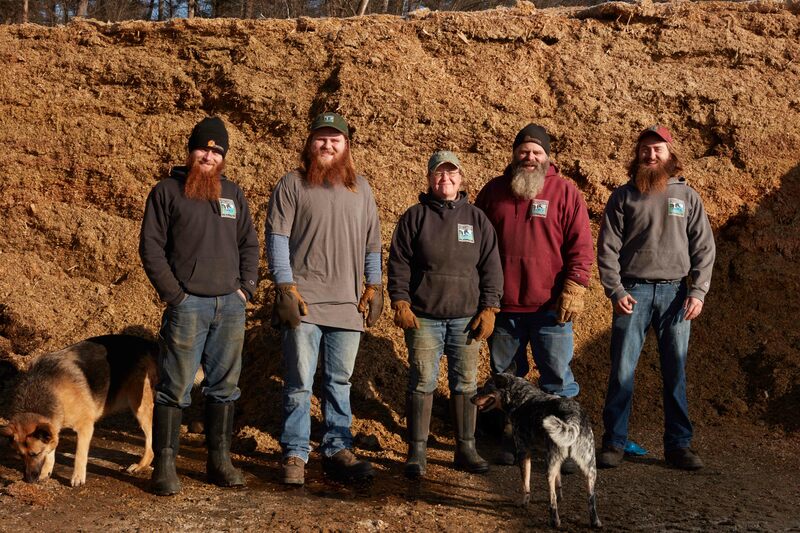 Jaime and Heather Robertson and their three sons Si, Nate, and Bram, who operate Bohanan Farm & Contoocook Creamery in Hopkinton, are one of five farms from across the country being featured on a new HISTORY series called ‘The American Farm’. HISTORY bills the show as, “an authentic portrait of the fight to go from seed to stalk, and from farm to fork. The series presents an up-close look at one full year of family farming.” A film crew spent most of last year documenting the lives of the Robertsons from the fields to the dinner table. Considering what a small segment of the country is actually involved in production agriculture, the Robertsons are hoping ‘The American Farm’ will help educate the general public on what is really happening on family farms. Nate, the middle child who focuses on herd management, wants people to be more aware of the hard-work and care that goes into putting the steak on their plate or the cheese on their pizza. “I was so excited to tell people what we’re doing, why we’re doing it, and why we think we’re doing it the right way,” he said. The family was a bit surprised, according to Nate, when they found out they would be featured. After all, “Who would want to watch you do stupid stuff with your brothers?” he joked. While the day-to-day chores the Robertsons undertake may seem like ‘just working’ to them, it’s an unknown world for 98% of the population. 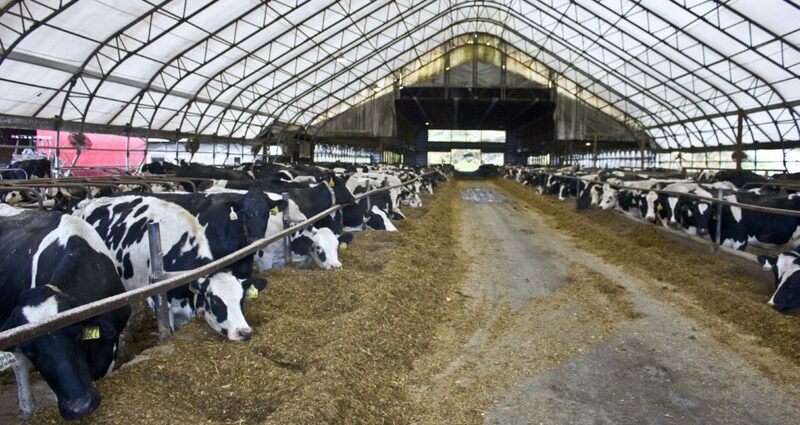 This entry was posted in Blog and tagged agriculture, Bohanan Farm, Contoocook Creamery, Dairy Farm, Family Farming, Farm TV, Farming in New Hampshire, HISTORY, Milk, New Hampshire, New Hampshire Farm Bureau, NH agriculture, Robertsons, The American Farm on April 3, 2019 by Josh Marshall - NHFBF Communications Director. 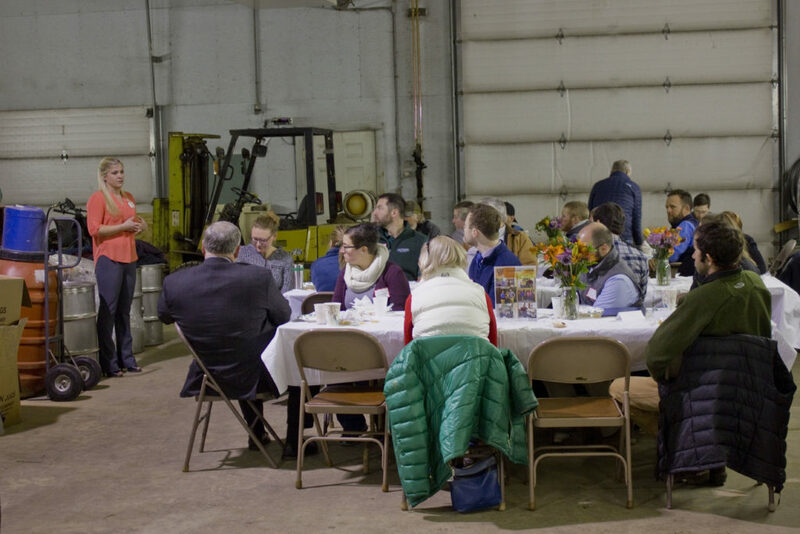 NHFB Young Farmer Committee Vice-Chair Nicole Glines speaks at the annual Young Farmer Legislative Breakfast, held this year at Pearl & Sons Farm in Loudon. This entry was posted in Press Release and tagged Agriculture in New Hampshire, agriculture policy, Legistlative Breakfast, NH Farm Bureau, NH Young Farmers, Policy Development on March 27, 2019 by Josh Marshall - NHFBF Communications Director. 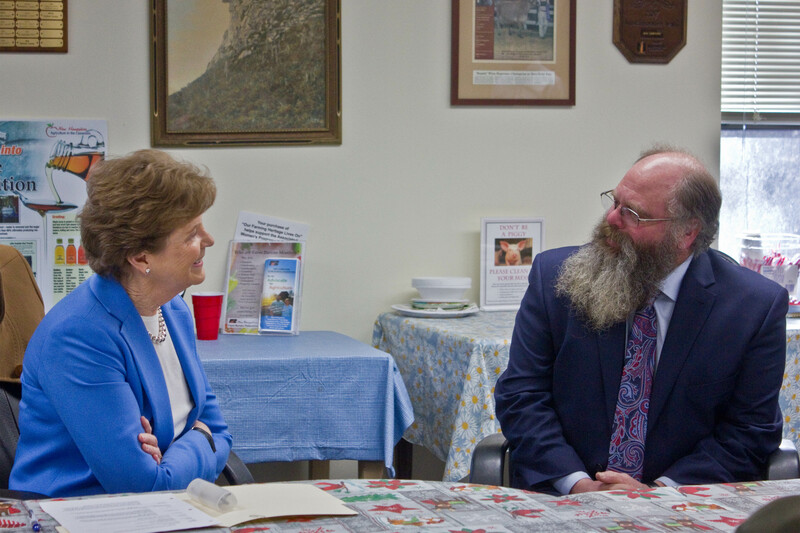 Senator Jeanne Shaheen speaks with dairy farmer Jamie Robertson, who along with his family, operates Contoocook Creamery in Hopkinton. Concord, NH. – New Hampshire’s senior Senator heard from a dozen or so NH farmers and agricultural specialists last Friday at the New Hampshire Farm Bureau Federation (NHFB) office in Concord. Senator Jeanne Shaheen wanted to know how or if the partial government shutdown, now in its third week, is weighing on farmers in the Granite State. This entry was posted in Press Release and tagged Dairy Industry, Farming, Fruits and Vegetables, Government Shutdown, Granite State, Horticulture, Immigration, New Hampshire Farm Bureau, New Hampshire Farmers, NH agriculture, NHFB, Senator Shaheen, Tariffs on January 7, 2019 by Josh Marshall - NHFBF Communications Director. 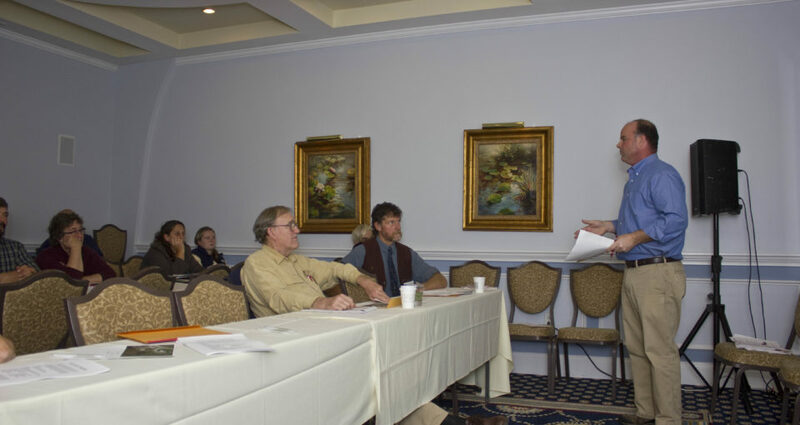 The culmination of NHFB’s grassroots policy development process occurs during the Meeting of the House of Delegates as part of each year’s Annual Meeting. Delegates, elected by their county Farm Bureau, met the morning of November 3rd to vote on the policies that will guide NHFB’s work in the coming year and to elect a slate of officers for 2019. The elected slate of officers is as follows: Denis Ward of Monroe – President, Joyce Brady of Columbia – 1st Vice President, Matt Scruton of Rochester – 2nd Vice President, Rebecca Stevens of Epsom – 2nd Vice President, Howard Pearl of Loudon – Treasurer. The Annual Meeting Banquet, held the evening of November 2nd, recognized outstanding achievements and contributions to agriculture from NHFB members. To view the full list of awards given out that evening, click here. The 102nd Annual Meeting of New Hampshire Farm Bureau started off with a farm tour of Fuller's Sugarhouse. 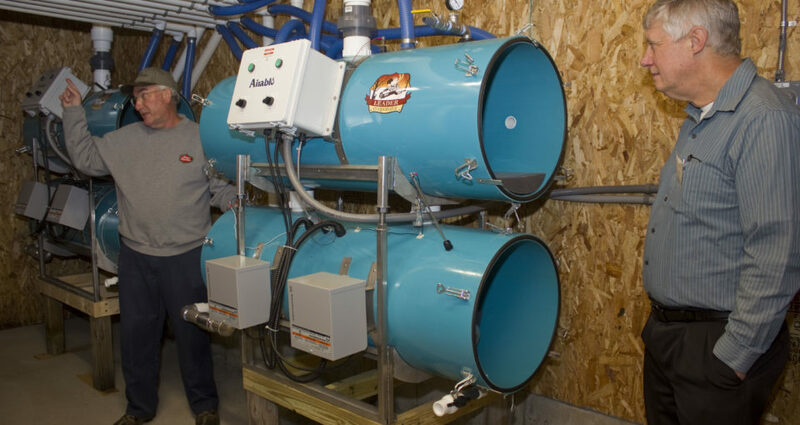 Here owner David Fuller explains how sap flows throughout the facility while Stan Knecht looks on. The next stop on the tour was Forbes Dairy Farm in Lancaster. The multi-generation farm is the largest dairy farm in the state. Johnna Miller from American Farm Bureau Federation hosted a workshop on Advocacy Through Social Media during the afternoon sessions. The next workshop was titled, "Preparing for Farm Emergencies" and featured insightful tips on how to work with local first responders to protect your property in the unfortunate event of an emergency. Between workshops, former NHFB Staff Maureen Duffy-Bertolone congratulated retiring UNH Extension Field Agent Steve Turaj. Past NHFB President Lawrence Underhill (Left) and past Cheshire County Farm Bureau President Bob Moore caught up before the Annual Meeting Banquet Dinner. 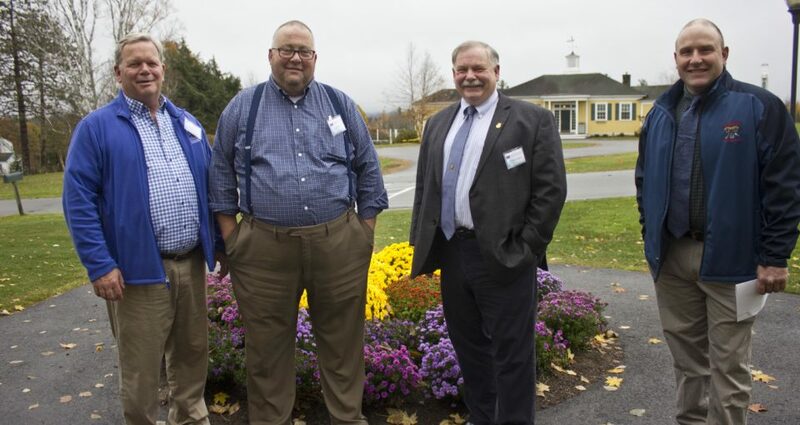 (Left to right) Dean of UNH College of Life Sciences and Agriculture Jon Wraith, Scott Mason, NH Commissioner of Agriculture Shawn Jasper, and Chris Brady enjoy a break in the weather outside at the beautiful Mountain View Grand Resort in Whitefield. 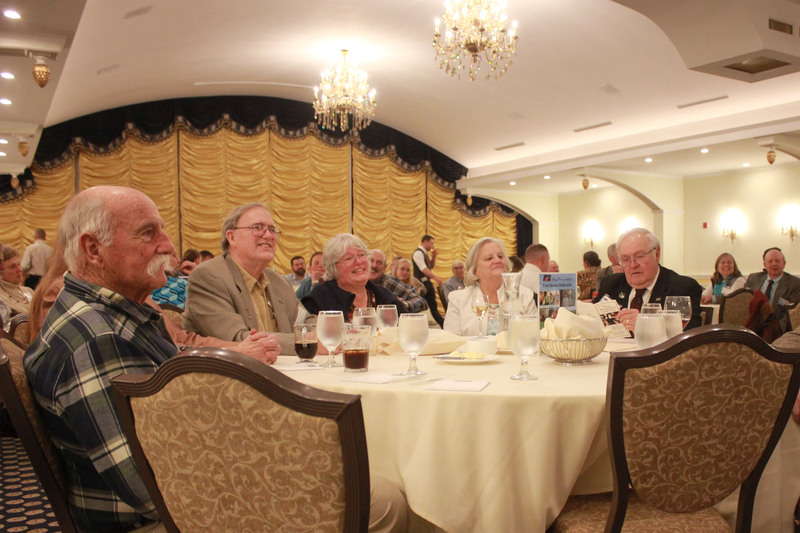 (left to right) Steve and Lora Goss chat with NHFB First Lady Jeanne Ward and NHFB President Denis Ward during the Annual Meeting Banquet Dinner. 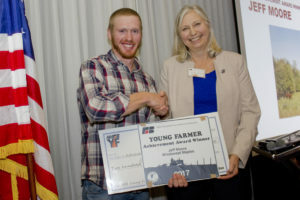 This entry was posted in Press Release and tagged Achievement Award, Agriculture in New Hampshire, Annual Meeting, Awards, Discussion Meet, Farm Bureau, New Hampshire Farm Bureau, NH Young Farmers, NHFB, Profile award on November 7, 2018 by Josh Marshall - NHFBF Communications Director. 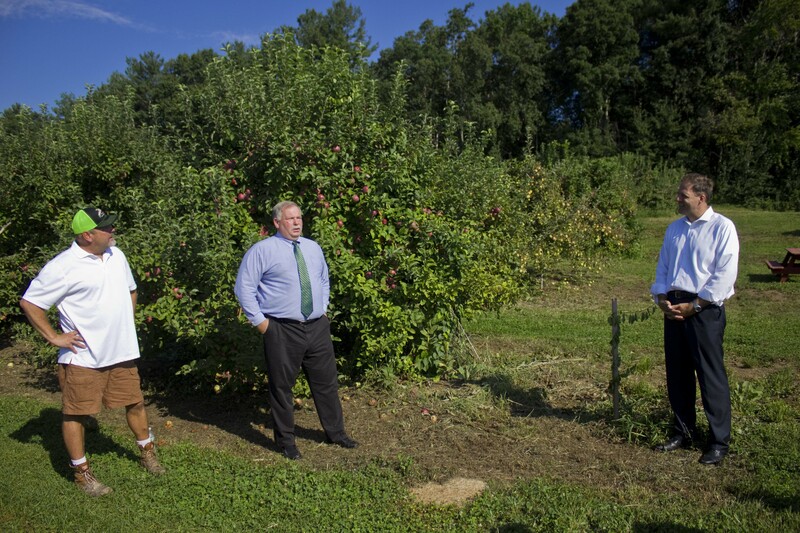 (Right to left) Governor Chris Sununu joins NH Commissioner of Agriculture Shawn Jasper and Dan Hicks, owner of Sunnycrest Farm in Londonderry, to mark the official start of apple season in New Hampshire. Thursday, September 6th marked the beginning of apple season in New Hampshire as Governor Chris Sununu made the ceremonial first pick at Sunnycrest Farm in Londonderry alongside Commissioner of Agriculture, Markets & Food Shawn Jasper, Sunnycrest owner Dan Hicks, and UNH Cooperative Extension Fruit & Vegetable Production Field Specialist George Hamilton. Also on hand were members of the New England Apple Association and New Hampshire Fruit Growers Association. This entry was posted in Blog and tagged Agriculture in New Hampshire, Farm Bureau, Farm Bureau Proud, NH Apple Day, NH Farm Bureau, NH Farms, Sunnycrest Farm on September 6, 2018 by Josh Marshall - NHFBF Communications Director. Throughout the month of August, New Hampshire Farm Bureau (NHFB) joins with 70+ partners throughout the state to highlight New Hampshire Eat Local Month — a month-long celebration of local food and New Hampshire farmers and producers. 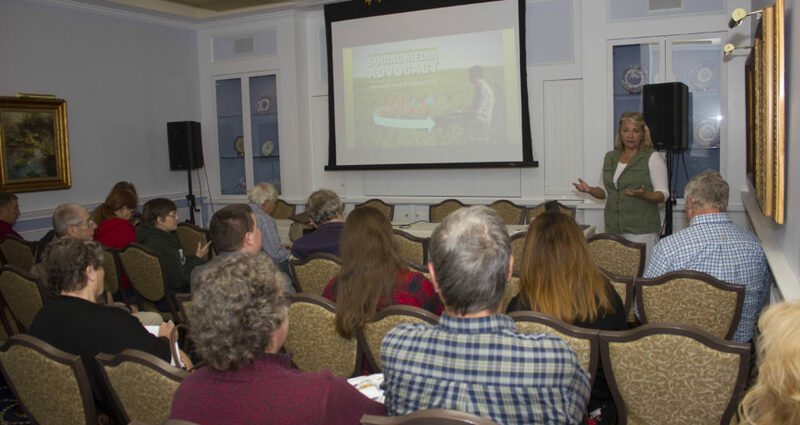 “New Hampshire residents, and visitors alike, are showing unprecedented interest in local food, and this month-long celebration offers a great opportunity to feature New Hampshire grown foods and farms,” said Gail McWilliam Jellie from the New Hampshire Department of Agriculture, Markets & Food. With 70+ partners working together to bring you great NH Eat Local Month festivities, it won’t be hard for you to find a way to get involved! This entry was posted in Blog, Press Release and tagged agriculture, Agriculture in New Hampshire, Farm Bureau, farmers, Farmers Market, Fresh produce, Local Food, New Hampshire, NH agriculture, NH Eat Local, NH Farm Bureau, NH Food Alliance, NH Harvest of the Month on August 1, 2018 by Josh Marshall - NHFBF Communications Director. Over the previous three years, over seven million households, on average, have tuned in to watch the Major League Baseball All-Star game and Tuesday night’s game should be no exception. Marking the mid-way point of the season, the All-Star Game pits the best players from the American League versus their National League counterparts for bragging rights at the highest level of America’s pastime. This year, the midsummer classic is being hosted at Nationals Park in Washington, D.C., just a few miles away from the American Farm Bureau Federation headquarters. 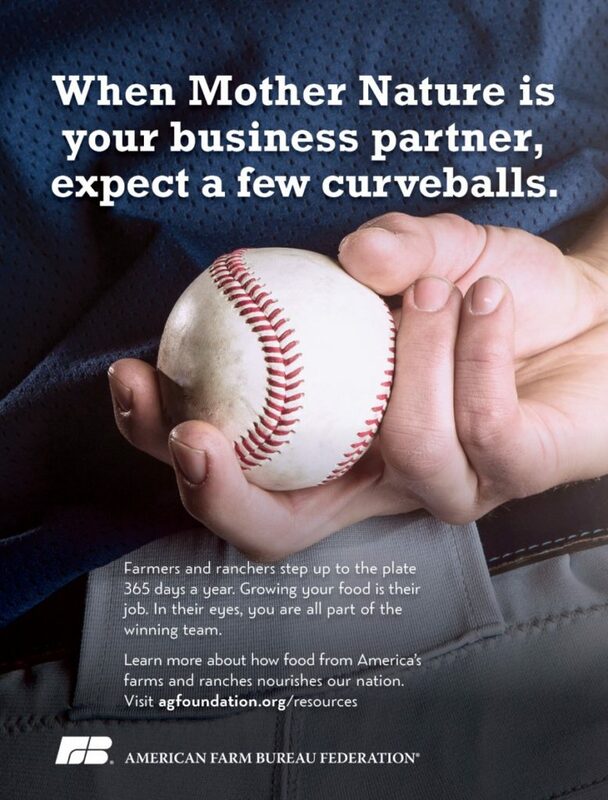 So, AFBF is swinging for the fences and placing an ad in the MLB All-Star Game Program. This entry was posted in Blog and tagged Advertising, Advocacy, AFBF, agriculture, Agriculture in baseball, All-Star Game, American Farm Bureau Federation, Baseball and Agriculture, Farm Bureau, Farm Bureau Proud on July 16, 2018 by Josh Marshall - NHFBF Communications Director. Sharing your story, connecting with the public, and educating new generations on the benefits of agriculture along with the quality of farmers' products and practices are key ways to strengthen the connection between producers and consumers. Why not accomplish all three and never leave your property? 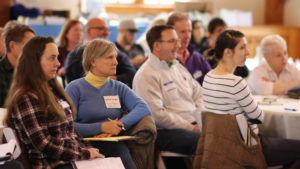 In late March, Jessica Ziehm of the New York Animal Agriculture Coalition (NYAAC), Laura Hardie of New England Dairy Promotion Board (NEDPB), and Emily Getty of Stonyfield led a farm tour workshop for dairy farmers and stakeholders at Stonewall Farm in Keene. The goal of the workshop was to prepare farmers with the tools and resources they need to host their own farm tours. Farm Bureau members and staff were there to participate and document the event. You can read more about the workshop here, watch the recap video produced by NHFB below, and download useful resources for hosting your own farm tours at the bottom of this page. This entry was posted in Blog and tagged agriculture, dairy, Dairy Farms, Farm Bureau, Farm Tour, New Hampshire, Resources on April 24, 2018 by Josh Marshall - NHFBF Communications Director. This entry was posted in Blog and tagged Ag Safety Awareness Program, Agriculture in New Hampshire, New Hampshire Farm Bureau, Rollover Protection, ROPS, Safety, Tractor on March 7, 2018 by Josh Marshall - NHFBF Communications Director. This entry was posted in Press Release and tagged Ag Safety Awareness Program, Farm Safe, New Hampshire Farm Bureau, NH Farms, Safety on March 5, 2018 by Josh Marshall - NHFBF Communications Director. 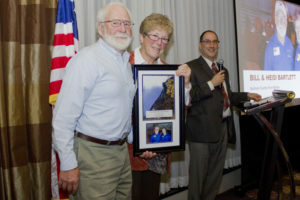 Bill & Heidi Bartlett of Bartlett’s Blueberry Farm in Newport were presented with the prestigious NHFB Profile Award by Seth Wilner at the NHFB 101st Annual Meeting. 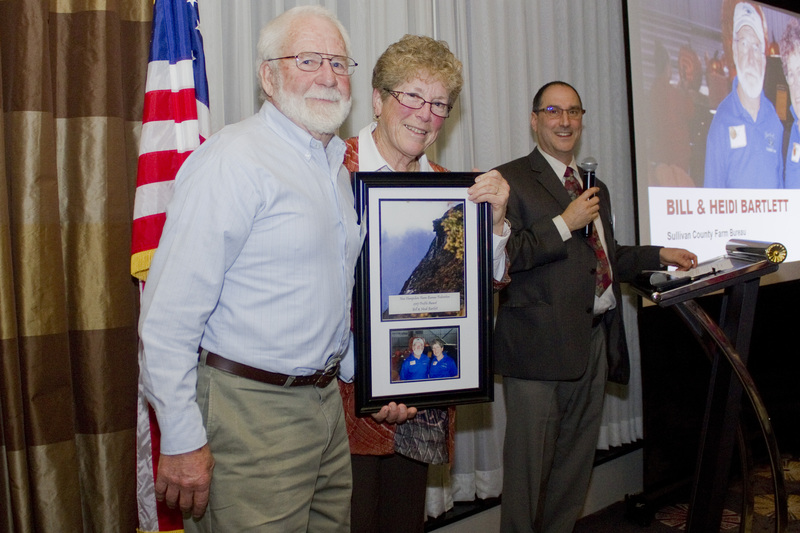 Each year, NHFB has the honor of presenting the Profile Award to recognize a New Hampshire person or persons for distinguished service to agriculture and rural life. Nominations for this award come from County Farm Bureau Board of Directors and are judged by a panel of past Profile Award winners. The 2017 Profile Award was presented to Bill & Heidi Bartlett of Bartlett Blueberry Farm in Newport, NH. 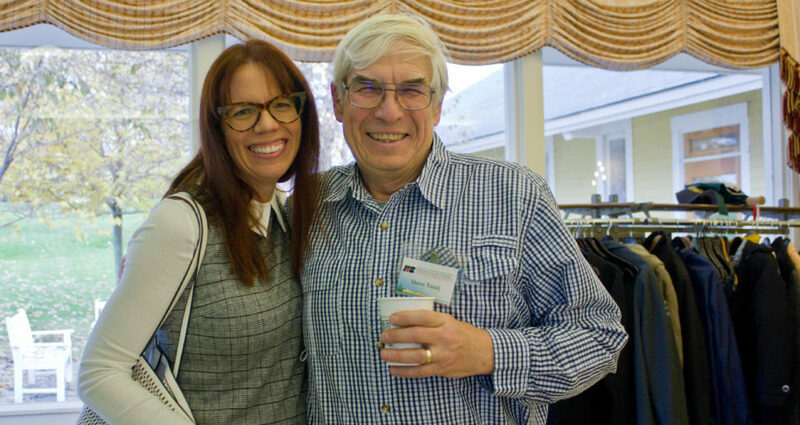 Bill & Heidi Bartlett purchased what is now Bartlett’s Blueberry Farm in Newport in 1985 and have continued its growth as a successful farm and business for over 30 years. 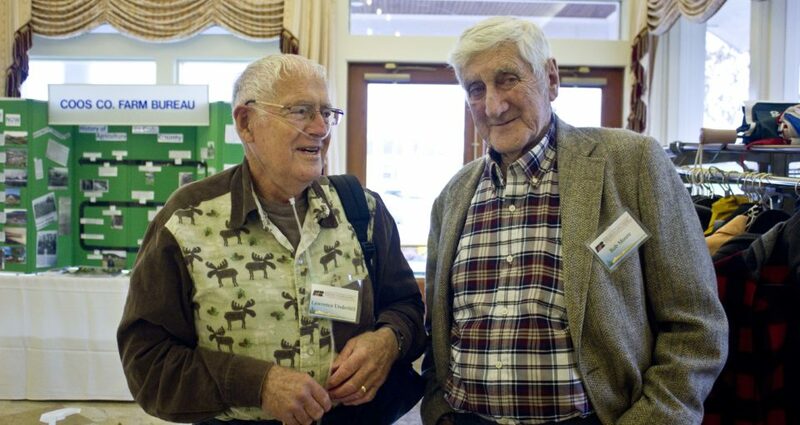 Beyond that, their contributions to the community have been just as important as their dedication to agriculture. This entry was posted in Press Release and tagged Agriculture in New Hampshire, Annual Meeting, Bartlett, Farm Bureau, New Hampshire Farm Bureau, Profile award on November 14, 2017 by Josh Marshall - NHFBF Communications Director. 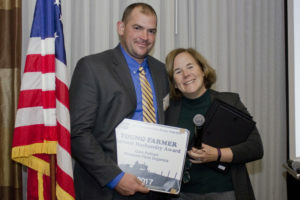 Jeff Moore was presented with the NHFB Young Farmer Achievement Award by Gail McWilliam Jellie at the NHFB 101st Annual Meeting. This year’s NHFB Young Farmer Achievement Award went to Jeff Moore of Windswept Maples Farm in Loudon, NH. The NHFB Young Farmer Achievement Award competition recognizes young people between the ages of 18 to 35 who have excelled in their farming operation and have shown leadership abilities through Farm Bureau and in their community. The ideal candidate for the award is an individual or couple involved in production agriculture with the majority of their income subject to normal production risk. This entry was posted in Press Release and tagged Achievement Award, Agriculture in New Hampshire, Annual Meeting, Farm Bureau, New Hampshire Farm Bureau on November 14, 2017 by Josh Marshall - NHFBF Communications Director. 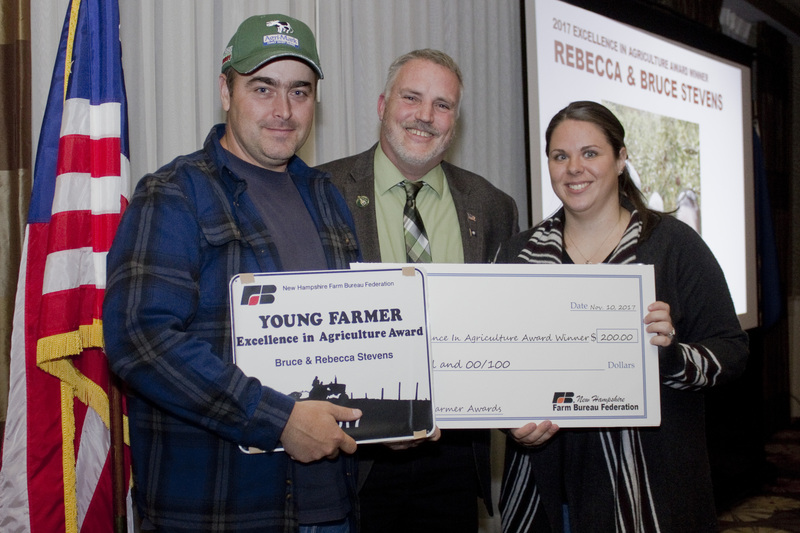 The 2017 NHFB Young Farmer Excellence in Agriculture Award was given to Bruce & Rebecca Stevens of Epsom, NH. The award acknowledges the efforts of Young Farmers who do not derive the majority of their income from farming, but are actively contributing to agriculture and to their community. Bruce & Rebecca Stevens have a small farm in Epsom raising beef cattle and hay. Rebecca became involved with FFA while attending Coe-Brown Northwood Academy winning numerous awards and serving as chapter Vice-President. She was instrumental in the formation of the school’s FFA Alumni Chapter and served two terms as President. Bruce gained experience in agriculture working for local dairy farms and eventually started working for Dairy Farmers of America as a milk truck driver. He now owns his own commercial trucking company. 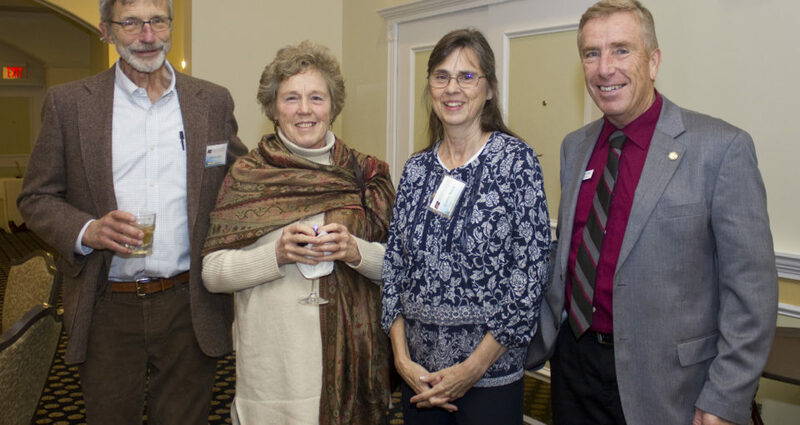 Rebecca has served on the Merrimack County Farm Bureau Board of Directors for many years and is currently serving her first term as President. This entry was posted in Press Release and tagged Agriculture in New Hampshire, Annual Meeting, Excellence in Agriculture, Farm Bureau, New Hampshire Farm Bureau on November 14, 2017 by Josh Marshall - NHFBF Communications Director. Glen Putnam was awarded the 2017 NHFB Young Farmer Animal Husbandry Award by NHFB Executive Director Diane Clary at the organization’s 101st Annual Meeting. 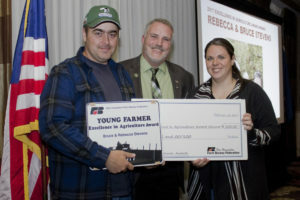 Glen Putnam was awarded this year’s NHFB Young Farmer Animal Husbandry Award. He owns and operates Winsome Farm Organics in Piermont, NH producing organic milk, beef, and more as a sixth generation farmer. This entry was posted in Press Release and tagged Agriculture in New Hampshire, Animal Husbandry, Annual Meeting, Farm Bureau, New Hampshire Farm Bureau on November 14, 2017 by Josh Marshall - NHFBF Communications Director. Amelia Aznive won the 2017 NHFB Young Farmer Discussion Meet at the organization’s 101st Annual Meeting. She will move on to compete nationally in Nashville, Tennessee in January. 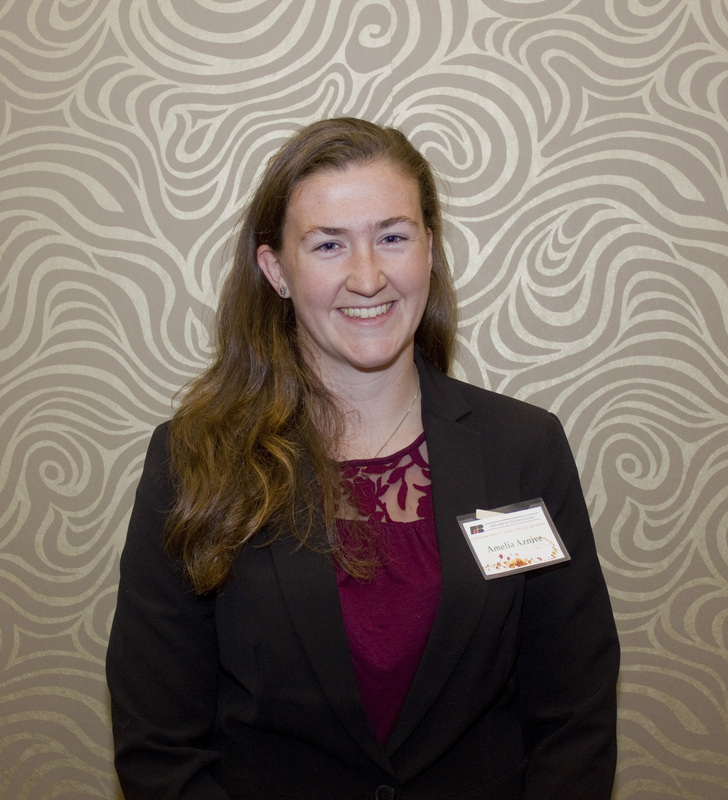 Amelia Aznive of Concord, NH was named the winner of the 2017 NHFB Young Farmer Discussion Meet. Competitors in the Discussion Meet prepare thoughts and opinions on various subjects facing agriculture and cooperatively work towards a solution. The goal of the Discussion Meet is to develop leaders for effective problem solving through group discussion, similar to the organization’s grassroots policy development process. 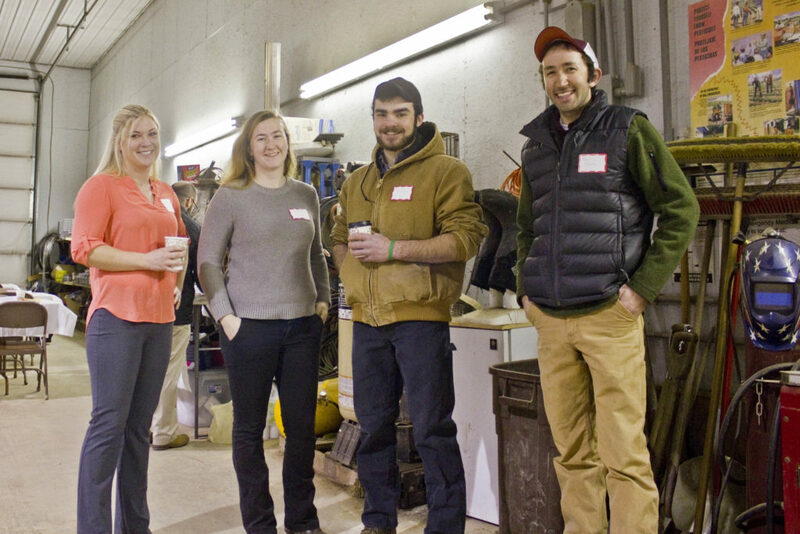 The competition provides an opportunity for Young Farmers to build basic discussion skills, give and receive criticism in a helpful manner, develop an understanding of important issues, explore and pool knowledge to reach consensus, and solve problems. This entry was posted in Press Release and tagged Agriculture in New Hampshire, Annual Meeting, Discussion Meet, Farm Bureau, New Hampshire Farm Bureau, NH Young Farmers on November 14, 2017 by Josh Marshall - NHFBF Communications Director.